A huge blow has been dealt to the Chess Olympiad in Tromsø less than three months before the first move is supposed to be made on August 1st. The worst-case scenario? Cancellation of the whole event. The Chess Olympiad in Tromsø this year appears to be in serious trouble after news received today from the Norwegian government. What exactly is going on? Here’s a summary of the latest developments. Today it was announced during Norway’s revised national budget that the event will not get the additional 15 million NOK (about 1.85 million EUR) that the organisers had applied for. 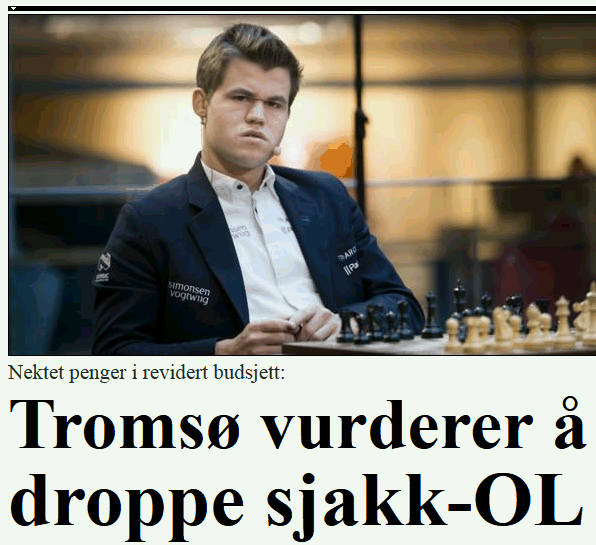 That was big news covered by most of the country’s media on Wednesday - “Chess Olympiad in Tromsø may be cancelled”, “Chess Olympiad in 2014 checkmated by the government”, “The situation is critical and dramatic”, “Chess Olympiad in need of money” were just some of the headlines. The consequences are very serious. We’re in a situation where we have to see if we are able to host the Chess Olympiad. We were very hopeful that we would get this [amount] covered. I thought the politicians would see the sense in this. 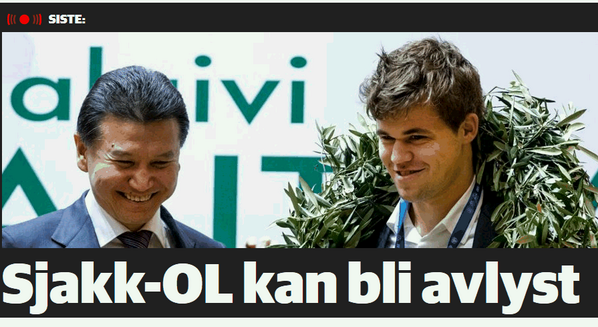 The organisers of the Chess Olympiad have already received 75 million NOK [about 9.23 million EUR] from the state. That’s 5 million more than they originally applied for because they got an additional 5 million for the opening ceremony. When you receive support from the state you have to adapt the event to the amount you applied for and received. It’s not possible for us to offer any more support. Even if the state secretary rules out any support the budget still needs to be debated and approved by parliament on June 20. However, it seems clear that a decision needs to be made before that. In May 2010 the Norwegian Government provided a guarantee for 75 million NOK, which was crucial to launching a bid to host the Chess Olympiad in Tromsø. At the time of applying for state support, in April 2009, it was not, however, known that a bid would have to include the 2013 FIDE World Cup in order to be considered. It got us off to a bad start. The criteria that we were basing our application on when we applied in 2009 were changed midway. The last World Cup cost 13.6 million NOK. A record number of nations will attend the Chess Olympiad in August, which increases the expenses for accommodation and lodging by 2 million NOK. First, we need to speak to our owners. If we don’t get the money we expected we need to sit down and consider what to do next. The Tromsø 2014 organisation is 90% owned by the municipality of Tromsø and 10% by the Norwegian Chess Federation. Neither of them have the resources to bring in the necessary funds. Of course we do have some commitments to FIDE. We’ve made guarantees that they can use our money to organise the Chess Olympiad somewhere else if it’s not possible to go through with the event in Tromsø. It’s not about putting pressure on anyone but instead recognising that we’ve reached a point where we have to explain how the situation stands. The figures show this isn’t going well, so we have to be honest. Karde says they need a decision by the end of May on whether or not they can go through with the event as planned. Still light at the end of the tunnel? When the Ministry of Culture suggest not giving us this extra amount they know full well why we applied for it and the consequences of not accepting. The sooner, the better. There’s still hope as there will be negotiations between the government and the partners. I hope good sense prevails. This is an important case that the Government should have followed up on. They haven’t done so, meaning we have to discuss it in the budget negotiations. The application for extra funding from Tromsø was well-founded. This is not about asking for money that they wasted. A month ago, professional service company KPMG was announced as the main partner of Tromsø 2014. Major sponsorship deals were previously signed with Sparebank 1 Nord-Norge and the University of Tromsø, while NRK, the state broadcaster, won the rights to show the event on TV. It hasn’t all gone entirely according to plan in Tromsø, however. Several people in the Tromsø organisation have openly expressed their anger over the Norwegian Chess Federation working on funding a bid for the World Championship match. Earlier this week Ulf Hansen, a member of the Tromsø 2014 board, resigned from his position in protest. 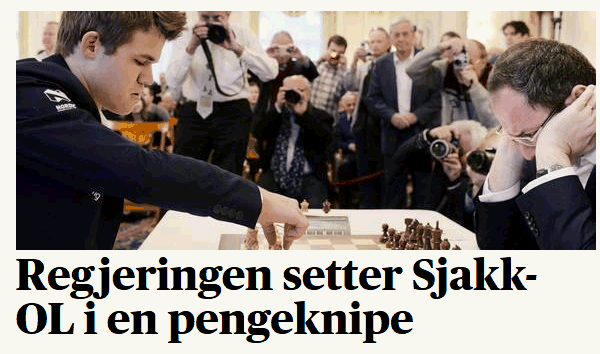 He blamed Jøran Aulin-Jansson, the President of the Norwegian Chess Federation, for being disloyal. I consider this disloyal of the president, and it seems like he’s going it alone. He’s also the Vice Chairman of Tromsø 2014, and has been since 2008. I don’t share that view at all. I haven’t meant to be disloyal and I don’t see why I would be. We just have to accept that Ulf Hansen and I disagree. chess24: Does the event depend on the full amount of 15 million NOK, or can the event take place with a smaller amount, for example 10 million and cutting costs? In our budget we estimated 150 nations, but 181 have signed up. In our application to the state we asked for an amount according to "2009 money", but we got "2014 money", meaning it wasn’t adjusted for inflation. That means around 6 million NOK. If you add all these things together it becomes more than 20 million. When we ask for 15 million, that's what we need. Are there still contacts and discussions with possible sponsors? Yes, we’re in touch with several big sponsors. If they come we’ll be able to improve the experience even further. Hans Olav Karde told VG that a decision must be made by the end of May, but you say there’s no final date. When will the decision be made? As soon as possible, meaning it's urgent. State Secretary Knut Olav Åmås from the Ministry of Culture rules out giving any more support saying, “the event should be adapted to the amount they asked for and received”. What's your opinion on that? I wish he could see the sense in what we’re asking for and why we're asking for it. Fortunately, Ola Elvestuen from Venstre does and I've spoken to several others who do as well. UPDATE 2:The World Chess Federation (FIDE) was quick to respond on their website to the media coverage in Norway, choosing one of the banes of chess politics – open letters. Both were written by FIDE Treasurer and Executive Director Nigel Freeman, to Hans Olav Karde, Chairman of the Tromsø 2014 Organising Committee, and Jøran Aulin-Jansson, President of the Norwegian Press Federation. Perhaps, with hindsight, we should have realised when you unilaterally decided to ask for a €100 administration fee. As I have written several times, this was not in your original bid and is not accepted by FIDE. FIDE believes that if this had been disclosed in your bid, then the voting would have been different. This therefore cannot be charged. We could probably have given clearer signals earlier, but we believe we did actually give signals. FIDE claims we included no charges in our bid, but we claim we did include them… This is the same as they had during the Olympiad two years ago. No bids for Anand-Carlsen rematch - what now?